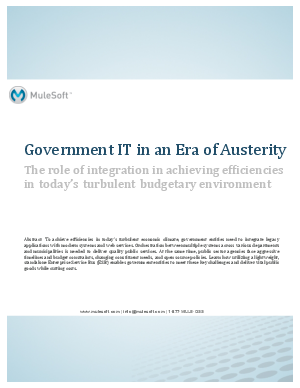 To achieve efficiencies in today’s turbulent economic climate, government entities need to integrate legacy applications with modern systems and web services. Orchestration between multiple systems across various departments and municipalities is needed to deliver quality public services. At the same time, public sector agencies face aggressive timelines and budget constraints, changing constituent needs, and open source policies. Learn how utilizing a lightweight, standalone Enterprise Service Bus (ESB) enables government entities to meet these key challenges and deliver vital public goods while cutting costs. Learn to deliver projects within tight schedules and fiscal constraints - download now.